The first week of trading in 2019 ended on a high note after a blowout December jobs report and Federal Reserve Chairman Jerome Powell’s speech helped to calm jittery investors. All three of the major indices closed higher. The S&P 500 (^GSPC) ended the week up 1.86%, while the Dow (^DJI) rose 1.61%, and the Nasdaq (^IXIC) jumped 2.34%. On the heels of a monster jobs report, investors will turn their attention to the Consumer Price Index (CPI) data released on Friday, January 11. The Fed often looks to CPI data as a key inflation gauge. Economists polled by Bloomberg are expecting “core” consumer prices excluding the cost of food and gas to have risen 2.2% in December from a year ago. The Fed is targeting 2% inflation. “Given that the FOMC focuses on core inflation in its near-term policy deliberations, a downside miss on the headline is unlikely to ring alarm bells if driven by drops in energy and/or food. An increase in core CPI of 0.1-0.2% would be consistent with the recent trend,” Wells Fargo wrote in a note on Friday. On Wednesday, the Federal Open Market Committee (FOMC) minutes will be released. On Thursday, Powell will speak from the Economic Club of Washington D.C. at noon ET, and Fed Vice Chairman Rich Clarida will be speaking at the Economic Outlook and Monetary Policy at the Money Marketeers of New York University at 7 p.m. ET. Market watchers will also be focusing on trade talks that are scheduled to take place on Monday January 7- Tuesday January 8 in Beijing. While President Trump and President Xi Jinping will not be meeting in person, Deputy U.S. Trade Representative Jeffrey Gerrish will be meeting with his Chinese counterparts. This will be the first in-person meeting between the two nations since the G20 summit in Argentina in early December. Additionally, the Superbowl of consumer electronics, CES 2019, kicks off on Tuesday, January 8 for a four-day event in Las Vegas. Some of the brightest minds in tech will be speaking and the newest gadgets and tech will be displayed. Corporate earnings remain light next week. On Wednesday, Lennar (LEN) and Constellation Brands (STZ) will report before the market open, and Bed Bath & Beyond (BBBY) and KB Home (KBH) will report after the market close. The stock market is not the economy. The labor market is. And though the stock market and the economy do move in the same general direction over the long run, Friday’s December jobs report was one of the strongest examples in recent memory bolstering the case that the stock market is not, in real-time, a very good indicator of how the economy is performing. That distinction belongs to the labor market. In the final month of 2018, 312,000 new jobs were created in the U.S. economy while the unemployment rate rose by 0.2% as more people joined the labor force and wages rose 3.2% over the prior year, the fastest pace since April 2009. Labor force participation in December rose to match its highest level since May 2014 and is an encouraging sign that the most recent phase of the economic expansion is pulling previously disengaged workers back into the workforce. Among prime-age workers, labor participation is now matching levels last seen in 2010. Overall hiring in 2018 eclipsed 2 million for the seventh-straight year, with over 2.6 million new jobs created, the most of any year since the crisis except for 2015. In each of the last three months, the overall unemployment rate stood at 3.7%, the lowest level since 1969. The underemployment rate, which includes people out of work as well as those working part-time but who want full-time work, was at 7.6% in December, and since March of this year the underemployment rate has remained below any reading seen before the financial crisis. Economists at Capital Economics said Friday that, “It appears higher wages are the reason why people are returning to the active labor force in large numbers.” A sign that not only is the labor market continuing to expand but improving such that some of the deepest crisis-era scars are starting to heal. In his second press conference as Federal Reserve chair back in June, Jay Powell said his “plain-English” summary of the economy was that, “the economy is doing very well, [m]ost people who want to find jobs are finding them, and unemployment and inflation are low.” All three trends remain in place today. On the other hand, the decline in financial markets seen during the fourth quarter implied recession was imminent. Deutsche Bank analysts noted back in December that the median decline in the S&P 500 during a recession has been 21% since World War II. In late 2018, the S&P 500 fell 19.8% peak-to-trough, essentially pricing in a full recession. If a recession does not come to pass, the current market move has grossly overstated an economic slowdown that most commentators expected would follow the tax cut-juiced economic run enjoyed in 2018. And after a recent run of economic surveys indicated a slowdown in the pace of economic growth at the end of 2018, the December jobs report should be a reminder that slowing growth does not mean a contraction in activity. The gloomy view of economic growth being reflected by financial markets appears to be, for now, clearly overstating the case made by the data. Following Friday’s jobs report, stocks jumped higher. 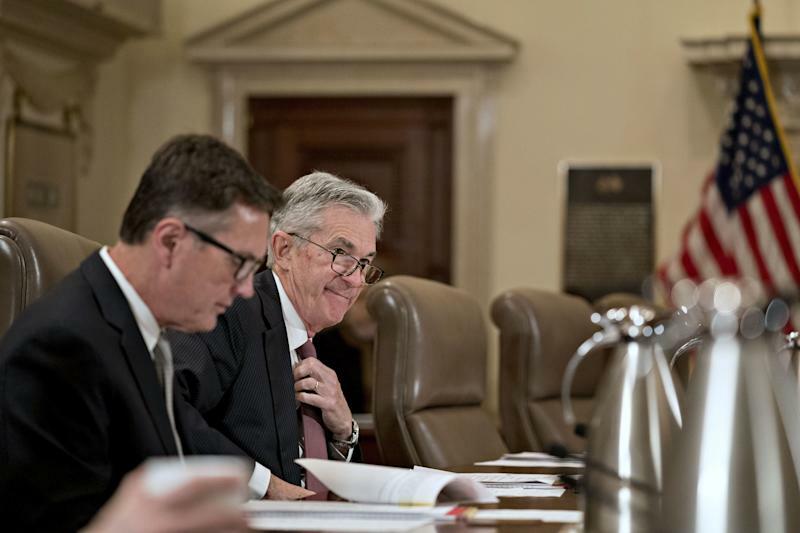 Commentary from Powell gave markets a further boost after he walked back his harshest language on the Fed’s balance sheet reduction and said the central bank is “listening carefully” to markets. As Powell enters his second year as Fed chair, it appears his communication strategy continues to be more refined and more clear. And while some outspoken critics have blamed the Fed’s communication errors for the market volatility we’ve seen in the last several months, the market is also very concerned about Trump’s trade war and a slowdown in the Chinese economy. News out of Apple on Wednesday and the ensuing market reaction on Thursday reinforced the idea that market worries reach beyond U.S. economic conditions. Kevin Hassett, the chairman of the president’s Council of Economic Advisors, said Thursday that “heck of a lot” of U.S. companies could have bad things to say about the Chinese economy in the coming months. This is a worry for markets that will persist through the early part of 2019, at the very least. But financial markets, as Josh Brown noted Thursday, can turn on a dime. The price of companies can be cut in half in just a few months even if they are worth hundreds of billions of dollars. Just look at Nvidia (NVDA). Financial markets have, on balance, been reacting to an anticipated slower pace of economic and earnings growth in the year ahead. It is the rate of change that concerns markets, not the absolute figures. The jump cut quality to the market’s overall direction and the narratives driving that action is what makes following markets fun. These moves are also not necessarily reflective of how economic trends play out. The U.S. economy and labor market continues to operate in its post-crisis trend of steady growth powered by the labor market. Various government policies along the way — the debt ceiling fight in 2011, the sequester in 2013, the tax cuts in 2017 — have aided or hampered that growth. The trend, however, remains clearly intact. U.S. consumer spending accounts for about 70% of overall GDP growth. U.S. consumers, on balance, have more jobs at higher wages while carrying less overall debt than before the last recession. This is the long-term, prevailing trend in the economy right now. That is made clear in the most recent labor market data. And another sign that the recession financial markets have braced for continues to be elusive in the actual economic data.